International Hippie: ramen noodles ...the best invention ever!!!!!!!!!!!!!!!!!!!!!!!!! ramen noodles ...the best invention ever!!!!!!!!!!!!!!!!!!!!!!!!! 2000 BC—Invention of noodles. Fossils discovered near China’s Yellow River suggest that the first noodles were made during the Late Neolithic period. Scientists speculate that the noodles were made from a combination of foxtail and broomcorn millet. 300-400 BC—Invention of hishio in China. Derived from fermented soybeans, hishio is an antecedent of both miso and shôyu. Early hishio was salty and pungent in flavor, porridge-like in texture, and dark brown in color. 1500-1700—Development of shôyu. The first written record of tamari-shôyu appears in 1559. Manufacturers outside Tokyo add roasted wheat—which darkened the sauce considerably—and rename their product koikuchi (“dark mouth”) shôyu. Usukuchi (“pale mouth”) shôyu is invented outside Kyoto in 1666. Shôyu broth is recommended in a cookbook published two years later. 1868-1912—The introduction of shina soba (“Chinese style” soup). Shina soba later comes to be known as ramen. Some linguists speculate that “ramen” is a Japanese adaptation of the Chinese term for hand-pulled noodles, la mien, though there are competing theories as to the origin of the name. 1955—Miso ramen invented in Sapporo. 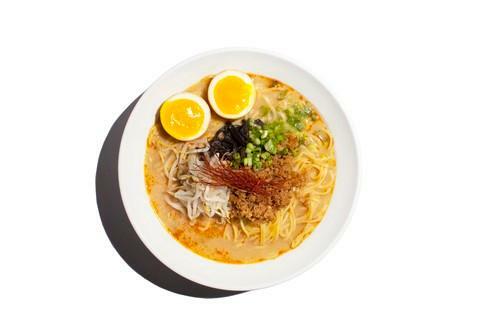 Miso ramen originally emerges as a light and flavorful noodle soup; an optional garnish of butter and a meatier soup base come into fashion in the 1960s, reducing any claims to healthfulness and increasing its popularity. 1958—Momofuku Ando invents instant ramen in his shed. Ando discovers that frying noodles both par-cooks and dehydrates them. He founds Nissin Foods and introduces Chikin Ramen to Japanese consumers. This is an excerpt from Karen Leibowitz’s piece “Momofuku Ando and the Invention of Instant Ramen,” from Issue 1 ofLucky Peach. The full timeline is available on Lucky Peach’s newly minted website. To subscribe to the magazine for a full year of essays, art, photography, and recipes, click here. Karen Leibowitz is the co-author of the Mission Street Food: Recipes and Ideas from an Improbable Restaurant, which she wrote with her husband, Anthony Myint.